Senator Bacchus- Baptiste is now an ordained pastor. Can she continue to sit in Parliament? After being ordained a pastor, Senator Kay Bacchus-Baptiste says that there is no issue with her being both a pastor and a member of Parliament, if one reads the Constitution properly. 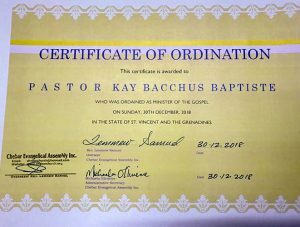 The picture shows a certificate of ordination presented to Pastor Kay Bacchus-Baptiste, which designates her as, Bacchus-Baptiste specifies, a “Minister of the Gospel”. She noted in speaking with SEARCHLIGHT yesterday, that it does not read “Minister of Religion”. The document certifies that she has been ordained a Pastor of the Chebar Evangelical Assembly, and was so authorized by Reverend Lemmew Samuel of the aforementioned Assembly on December 30, 2018. Since the certificate was published, there has been some talk surrounding it, particularly in relation to Chapter Three of the Constitution of St Vincent and the Grenadines, section 26, which deals with the composition of Parliament. She reiterates that certainly her principal role is as a lawyer. “The Constitution is clear, there is no issue except for malicious people, or people who don’t want to read and understand,” she noted. 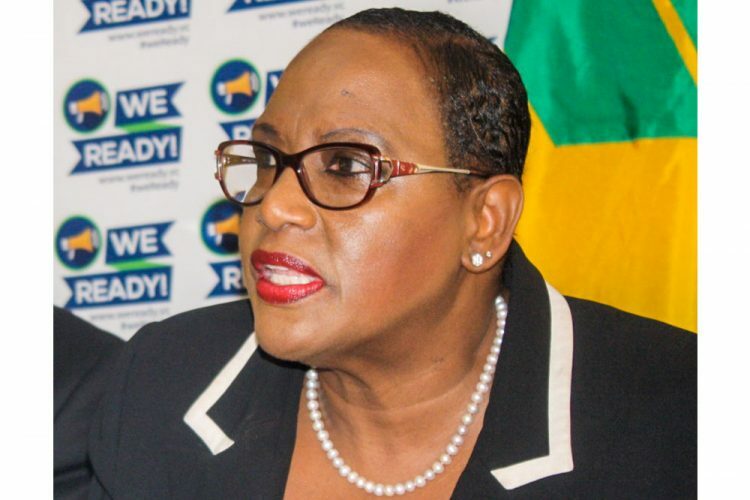 Bacchus-Baptiste, who was appointed a senator for the New Democratic Party in November 2017, also stated that she is not the first person to have the title “pastor” in Parliament. 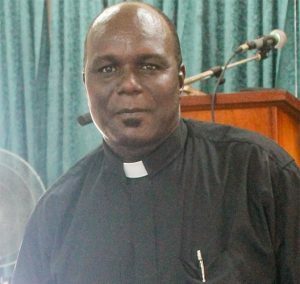 The crucial point of law under debate is if Bacchus-Baptiste is a minister of religion within the meaning of the provisions of the Constitution. As it stands, one interpretation of the provisions is that they create two separate categories of disqualification. A minister of religion “and any other” person whose principal occupation includes teaching or preaching in any congregation for religious worship. The words “any other” may be critical to that distinction, a legal expert told SEARCHLIGHT.